In order to obtain a high purification rate of the carbon monoxide (co), hydrocarbon (hc) and nitrogen oxide (nox) components in the exhaust gas, a twc is used. For the most efficient use of the twc, the air-fuel ratio must be precisely controlled so that it is always close to the stoichiometric air-fuel level. 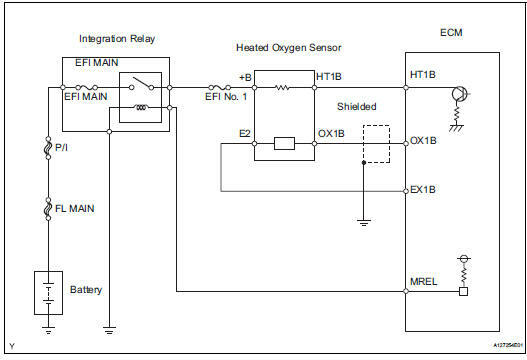 For the purpose of helping the ecm to deliver accurate air-fuel ratio control, a heated oxygen (ho2) sensor is used. 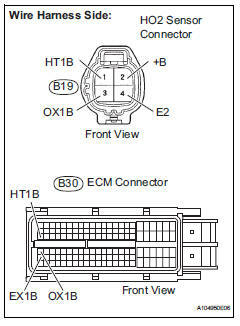 The ho2 sensor is located behind the twc, and detects the oxygen concentration in the exhaust gas. Since the sensor is integrated with the heater that heats the sensing portion, it is possible to detect the oxygen concentration even when the intake air volume is low (the exhaust gas temperature is low). When the air-fuel ratio becomes lean, the oxygen concentration in the exhaust gas is rich. The ho2 sensor informs the ecm that the post-twc air-fuel ratio is lean (low voltage, i.E. Less than 0.45 V). Conversely, when the air-fuel ratio is richer than the stoichiometric air-fuel level, the oxygen concentration in the exhaust gas becomes lean. The ho2 sensor informs the ecm that the post-twc air-fuel ratio is rich (high voltage, i.E. More than 0.45 V). The ho2 sensor has the property of changing its output voltage drastically when the air-fuel ratio is close to the stoichiometric level. The ecm uses the supplementary information from the ho2 sensor to determine whether the air-fuel ratio after the twc is rich or lean, and adjusts the fuel injection time accordingly. Thus, if the ho2 sensor is working improperly due to internal malfunctions, the ecm is unable to compensate for deviations in the primary air-fuel ratio control. The ecm usually performs air-fuel ratio feedback control so that the air-fuel ratio (a/f) sensor output indicates a near stoichiometric air-fuel level. This vehicle includes active air-fuel ratio control in addition to regular air-fuel ratio control. 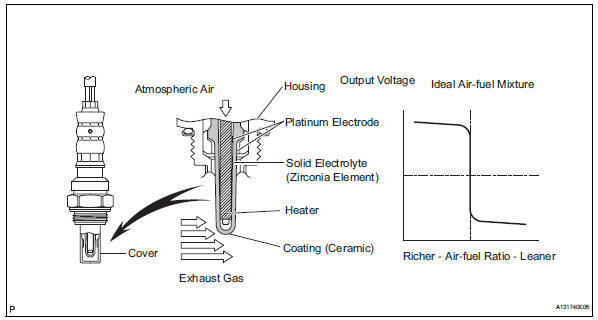 The ecm performs active air-fuel ratio control to detect any deterioration in the three-way catalytic converter (twc) and heated oxygen (ho2) sensor malfunctions (refer to the diagram below). Active air-fuel ratio control is performed for approximately 15 to 20 seconds while driving with a warm engine. During active air-fuel ratio control, the air-fuel ratio is forcibly regulated to become lean or rich by the ecm. If the ecm detects a malfunction, one of the following dtcs is set: dtc p0136 (abnormal voltage output), p0137 (open circuit) and p0138 (short circuit). While the ecm is performing active air-fuel ratio control, the air-fuel ratio is forcibly regulated to become rich or lean. If the sensor is not functioning properly, the voltage output variation is small. 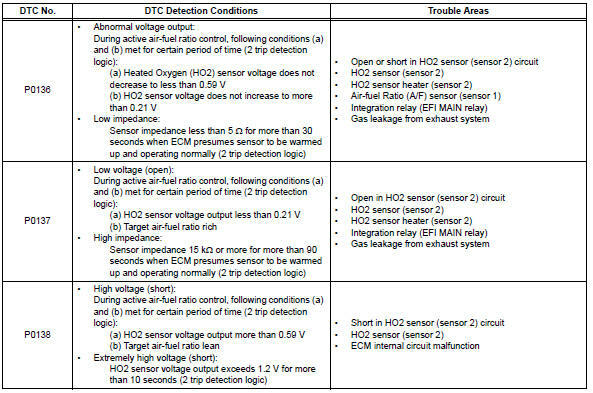 For example, when the ho2 sensor voltage does not decrease to less than 0.21 V and does not increase to more than 0.59 V during active air-fuel ratio control, the ecm determines that the sensor voltage output is abnormal and sets dtc p0136. During active air-fuel ratio control, the ecm calculates the oxygen storage capacity (osc)* of the three- way catalytic converter (twc) by forcibly regulating the air-fuel ratio to become rich or lean. 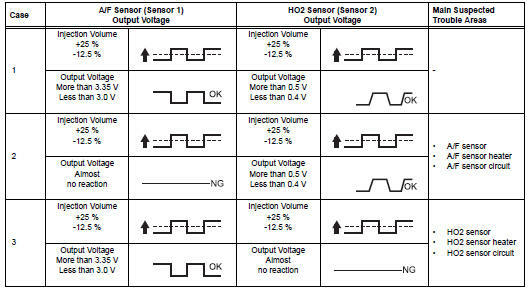 If the ho2 sensor has an open or short, or the voltage output of the sensor decreases significantly, the osc indicates an extraordinarily high value. Even if the ecm attempts to continue regulating the air-fuel ratio to become rich or lean, the ho2 sensor output does not change. 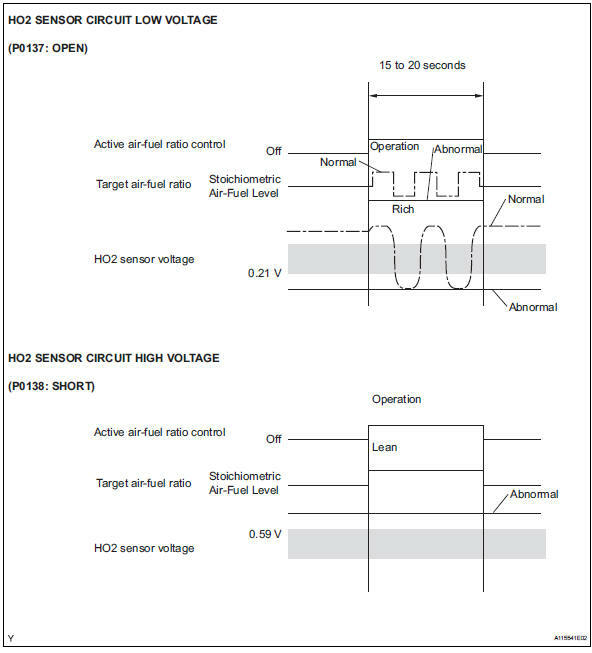 While performing active air-fuel ratio control, when the target air-fuel ratio is rich and the ho2 sensor voltage output is 0.21 V or less (lean), the ecm interprets this as an abnormally low sensor output voltage and sets dtc p0137. When the target air-fuel ratio is lean and the voltage output is 0.59 V or more (rich) during active air-fuel ratio control, the ecm determines that the sensor voltage output is abnormally high, and sets dtc p0138. Dtc p0138 is also set if the ho2 sensor voltage output is more than 1.2 V for 10 seconds or more. *: The twc has the capability to store oxygen. The osc and the emission purification capacity of the twc are mutually related. The ecm determines whether the catalyst has deteriorated based on the calculated osc value (see page es-191). During normal air-fuel ratio feedback control, there are small variations in the exhaust gas oxygen concentration. In order to continuously monitor the slight variations in the ho2 sensor signal while the engine is running, the impedance* of the sensor is measured by the ecm. The ecm determines that there is a malfunction in the sensor when the measured impedance deviates from the standard range. *: The effective resistance in an alternating current electrical circuit. The impedance cannot be measured using an ohmmeter. 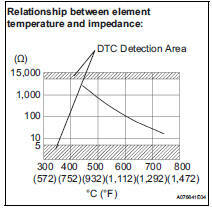 Dtc p0136 indicates the deterioration of the ho2 sensor. The ecm sets this dtc by calculating the impedance of the sensor when the typical enabling conditions are satisfied (2 driving cycles). Refer to checking monitor status (see page es-17). This confirmation driving pattern is used in the "perform confirmation driving pattern" procedure of the following diagnostic troubleshooting procedure. Performing this confirmation pattern will activate the heated oxygen (ho2) sensor monitor. (The catalyst monitor is performed simultaneously.) This is very useful for verifying the completion of a repair. Clear dtcs (if set) (see page es-35). Select the following menu items: diagnosis / carb obd ii / readiness tests. Check that o2s eval is incmpl (incomplete). Drive the vehicle at between 64 km/h and 113 km/h (40 mph and 70 mph) for at least 10 minutes. Note the state of the readiness tests items. Those items will change to compl (complete) as the o2s eval monitor operates. On the tester, select the following menu items: diagnosis / enhanced obd ii / dtc info / pending codes and check if any dtcs (any pending dtcs) are set. If o2s eval does not change to compl, and any pending dtcs fail to set, extend the driving time. Sensor 2 refers to the sensor mounted behind the three-way catalytic converter (twc) and located far from the engine assembly. 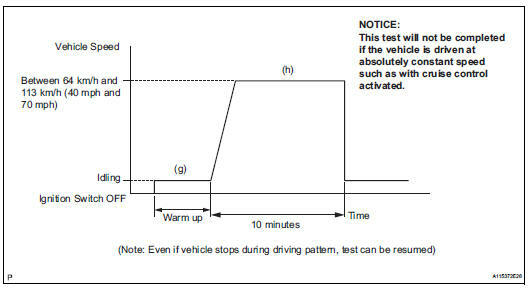 Malfunctioning areas can be identified by performing the a/f control function provided in the active test. The a/f control function can help to determine whether the air-fuel ratio (a/f) sensor, heated oxygen (ho2) sensor and other potential trouble areas are malfunctioning. The following instructions describe how to conduct the a/f control operation using the intelligent tester. Start the engine and turn the tester on. Warm up the engine at an engine speed of 2,500 rpm for approximately 90 seconds. On the tester, select the following menu items: diagnosis / enhanced obd ii / active test / a/ f control. Perform the a/f control operation with the engine idling (press the right or left button to change the fuel injection volume). Monitor the voltage outputs of the a/f and ho2 sensors (afs b1 s1 and o2s b1 s2) displayed on the tester. The a/f control operation lowers the fuel injection volume by 12.5 % Or increases the injection volume by 25 %. The sensors react in accordance with increases and decreases in the fuel injection volume. 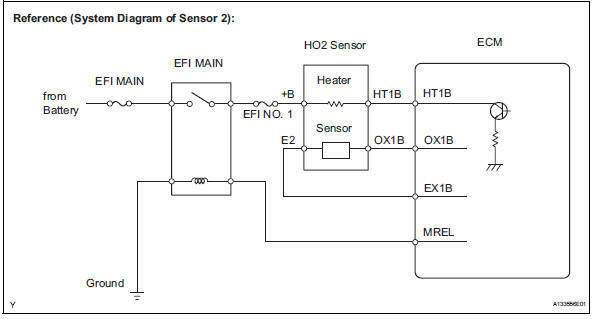 The a/f sensor has an output delay of a few seconds and the ho2 sensor has a maximum output delay of approximately 20 seconds. Following the a/f control procedure enables technicians to check and graph the voltage outputs of both the a/f and ho2 sensors. To display the graph, select the following menu items on the tester: diagnosis / enhanced obd ii / active test / a/f control / user data / afs b1 s1 and o2s b1 s2; then press the yes button and then the enter button followed by the f4 button. 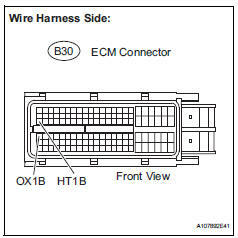 If the ox1b wire from the ecm connector is short-circuited to the +b wire, dtc p0138 will be set. Select the following menu items: diagnosis / enhanced obd ii / data list / primary / o2s b1 s2. Allow the engine to idle. 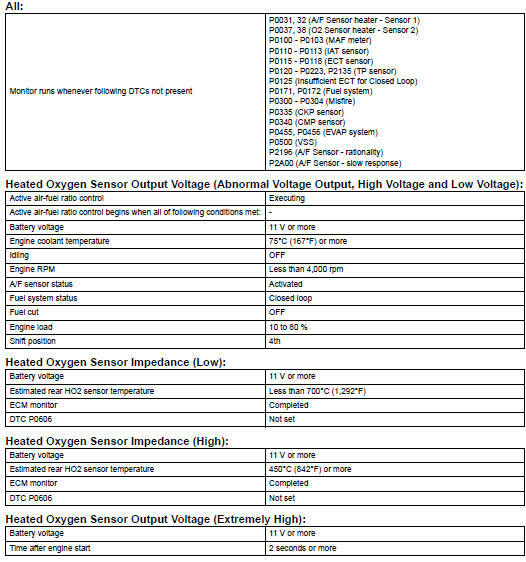 Read the heated oxygen (ho2) sensor output voltage while idling. Turn the ignition switch off and wait for 5 minutes. Disconnect the b19 ho2 sensor connector. Reconnect the ho2 sensor connector. On the intelligent tester, select the following menu items: diagnosis / enhanced obd ii / dtc info / current codes. After warming up the engine, run the engine at an engine speed of 2,500 rpm for 3 minutes. Read the output voltage of the ho2 sensor when the engine rpm is suddenly increased. Quickly accelerate the engine to 4,000 rpm 3 times using the accelerator pedal. 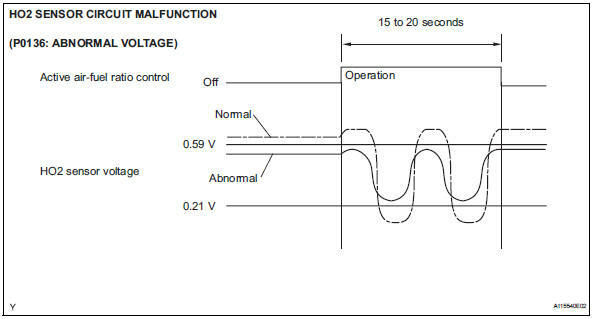 Standard voltage: fluctuates between 0.4 V or less and 0.5 V or more. Select the following menu items: diagnosis / enhanced obd ii / active test / inj vol. Change the fuel injection volume using the tester, monitoring the voltage output of air-fuel ratio (a/f) and ho2 sensors displayed on the tester. Change the fuel injection volume within the range of -12 % and +12 %. The injection volume can be changed in 1 % graduations within the range. 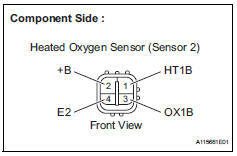 The a/f sensor is displayed as afs b1 s1, and the ho2 sensor is displayed as o2s b1 s2, on the intelligent tester. 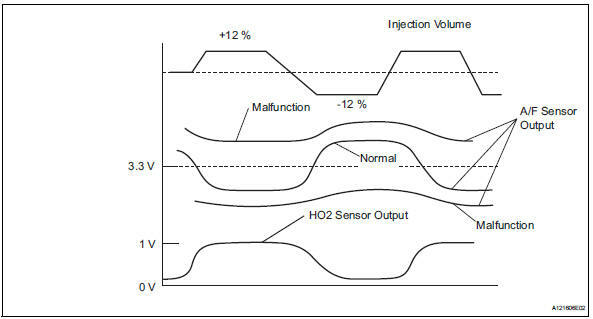 A normal ho2 sensor voltage (o2s b1 s2) reacts in accordance with increases and decreases in fuel injection volumes. 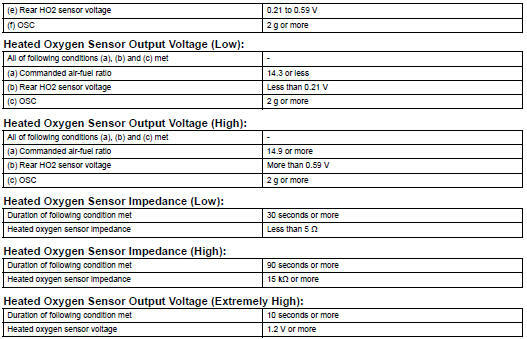 When the a/f sensor voltage remains at either less or more than 3.3 V despite the ho2 sensor indicating a normal reaction, the a/f sensor is malfunctioning. Measure the voltage between the +b terminal of the ho2 sensor connector and body ground.